Starry Stocking comes in two other colourways – Pink and Light Blue. 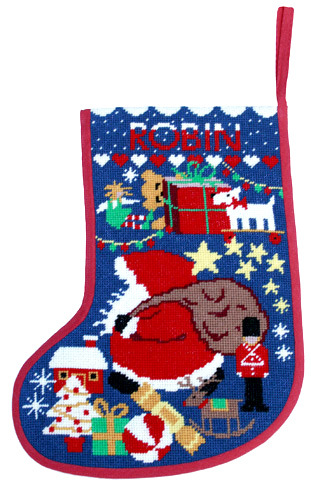 Midnight on Christmas Eve – this stocking is packed full of presents and Christmas fun; Santa is bustling about leaving a trail of stars behind him. If making up your stocking looks too daunting, please email or give us a call and we will do it for you. Last orders for guaranteed Christmas Delivery need to be in by November 1st. But it is always worth a call if you can’t quite make that date.